The fruit you can buy from small market stalls peppering London's pavements might not be organic, or always sourced from UK farms, but I think it tastes so much better than what you can buy in the supermarket. These stalls aren’t flashy or posh – they’re just geezers selling fruit out of cartons at the roadside. But the difference in quality compared to a supermarket is amazing – when I buy a nectarine or apricot from a supermarket, three times out of five they are bullet hard and either go mouldy upon ripening, or don't taste of anything much at all. Fruit Man of Victoria Street is there every week day, transistor radio blaring out classical music, and he always stocks the more interesting varieties. For example, I had never encountered a flat white peach before seeing them here, and he always has interesting seasonal UK produce, such as the best of the strawberries, raspberries and greengage plums. You can smell the heady aroma of the berries when you pick the cartons up, wafting out of the punnets like an intoxicating drug! Fruit Man always adds the personal touch – he can tell you how long to leave something to ripen up, or what’s tasting particularly good that day. He is proud of the fact that he gets his fruit fresh from Covent Garden market every day. “I don’t eat rubbish,” he says. Quite right. 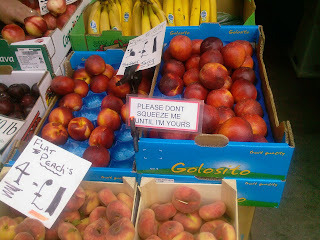 He adds lovely signs written in old fashioned handwriting, with messages such as ‘Please don’t squeeze me until I’m yours’ and is excited about the figs and grapes that will soon be flooding in. Sometimes he pops a free avocado into my bag. Why would I buy my fruit anywhere else? You don’t get this service in the bleak over-refrigerated atmosphere of a Tesco. By buying your fruit from small stalls, you're supporting small independent businesses and not doing all your food shopping through the supermarket monopoly. Spending a few less quid per week in the supermarket won't hurt the fatcats one little bit, but it will make a huge difference to the fruit man on the street. Right on - and peachy! They really are yummy. Husband looked at me like I was mad for squeeing gently at how cute they are. :) He still ate them though!